I think Howth is the most unpronounceable place name for many English speakers … a bit like people from Dublin find it difficult when they are in Wexford to pronounce the names of places such as Taghmon, Oulart and the Faythe. But, not having these problems, I suppose I have to explain why I have often neglected Howth. Perhaps it is because I imagine its beaches are less accessible than those nearer home. Or maybe it’s because Howth is a little off the M50 when thinking of weekend walks on the beach. However, I was there recently for a reception after a baptism, and there last year for a visit that ended up with a trip to the small island of Ireland’s Eye. At the end of a busy working week, two of us went out to Howth late this afternoon [14 August 2015] for a late lunch, and it took almost an hour to get there … we could have been in Wexford by then, but it was worth it. We joined friends and extended family for a late lunch in Beschoff’s on the West Pier, and probably lingered for a little too long. As a vegetarian, I would never have thought of lunch in Beschoff’s, but I was pleasantly surprised by my chickpea and aubergine salad with feta cheese, accompanied by a glass of Pinot Grigio, and followed (of course) with a double espresso. Earlier, the West Pier was full of groups of tourists, who sounded preponderantly like Italians. But by the time we had finished our late lunch, the pier was quiet, evening lights were beginning to change the colours in the sky, and the sun was preparing to set behind Sutton and Portmarnock to the west. After a grey, overcast day, it was delightful to find a glow of warmth in the evening sun as we looked out to Sutton and Portmarnock and north across the seemingly stretch of water separating Howth and tiny Ireland’s Eye. It is about two years since I promised myself I would return to the Black Apple Café at 206 Harold’s Cross Road and try the lunch menu. On my last visit, I had only a double espresso and a biscuit, but at the time I wished I had arrived in time for lunch. That opportunity came yesterday afternoon [13 August 2015], when I decided to walk part of the way home after presiding at the mid-day Eucharist in Christ Church Cathedral, Dublin. The last time I was in the Black Apple, I managed to find a table at the window looking out at the main street in Harold’s Cross. But I found a table on the street yesterday so that I could enjoy the afternoon summer sunshine, watching people and traffic passing by. My hopes and expectations about this café were met as I enjoyed a goat’s cheese salad served with red peppers, sun dried tomatoes, black olives, cashew nuts, sunflower seeds and balsamic dressing. As I read The Guardian and allowed that double espresso to linger a little longer, I let go of any worries about when the next 49 bus was due. It was difficult not to overhear the chatter at the next table about the best way to get around Rome as a tourist (on foot, of course), and where to find the best coffee shops and pizzeria near the Vatican. Later, I decided to cross the road and have another look at the sad and sorry state of No 201 Harold’s Cross Road. Five months ago, I wrote about the sad neglect and decay of this house, pointing out that this part of local history is in danger of being lost. Countless efforts have been made in recent years to have the complete building classified as a Protected Structure, and to ensure the protection of the railings and plinth wall in front. Looking at the house from the street, the surviving 18th century features include the blocked front doorcase. But the windows are boarded up and it looks derelict; the front garden is overgrown; and there is sense that the whole site is being neglected. But yesterday afternoon it seemed the only apparent change in the last five months is garish white wash that has been used to cover up graffiti on the walls, but that has simply defaced the attractive symmetry of the red-brick façade. This is a large red-brick building dating from 1750, and it appears on Rocque’s maps of 1756 and 1760. It was there Quaker abolitionist and philanthropist Richard Allen (1803–1886) was born on 8 January 1803. 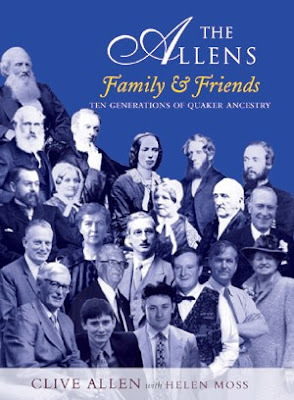 The story of the Allen family is told in detail by Clive Allen in his 2007 book The Allens, Family and Friends, ten generations of Quaker ancestry. When Richard Allen was born in this house in Harold’s Cross, it was the summer home of his parents, Edward and Ellen Allen. Edward Weston Allen (1765-1848) was a linen merchant and wholesale draper. In 1798, he married Eleanor ‘Ellen’ Barrington (1776-1819), descended from an old Quaker family from Co Wexford. Edward and Ellen Allen lived at 102 Saint James’s Street, and later at 22 Upper Bridge Street. But in the summer months they lived in this house in Harold’s Cross, which was then a rural area. Edward was a founding member of the Cork Street Fever Hospital, the Dublin Institution, and other charitable foundations. Towards the end of his life, Edward Allen moved to a house named Mountain View near Churchtown, where he died in 1848 at the age of 82. Although he had long stopped attending Quaker meetings and had left the Society of Friends, he was buried in Friends’ Burial Ground in Cork Street, Dublin. In all, Edward and Ellen Allen had 15 children. Their second son, Richard Allen, was born in the house in Harold’s Cross on 8 January 1803, and like some of his brothers and sisters was educated there privately by a tutor. At the age of 17, he joined the family business in Bridge Street. Although his father had been asked to leave the Society of Friends, Richard was an active Quaker and in 1828 he married into another Quaker merchant dynasty when married Anne Webb. But they never lived at the house in Harold’s Cross, living instead at Ellis Quay, and later at High Street, Dublin. He also had shops opposite the GPO in Sackville Street (now O’Connell Street), Dublin, and in Patrick Street, Cork. He was active in the movement for the abolition of slavery, took part in many anti-slavery conferences in London and lobbied parliament for more effective legislation outlawing the slave trade. In 1840, he attended the World’s Anti-Slavery Convention in London, the other Irish delegates including Daniel O’Connell and the historian Richard Robert Madden. His commitment to the anti-slavery movement became a financial risk to his business, and he also became involved in movements for prison reform and the abolition of the death penalty. His friends and wider circle included the freed slave Frederick Douglass, the American publisher William Lloyd Garrison, the temperance campaigner Father Theobald Mathew, the Dublin-born philanthropist Dr Barnardo, and the poet and balladeer Thomas Moore. He later lived at De Vesci Lodge in Monkstown and then at Brooklawn in Blackrock, Co Dublin, where he died in 1886. But by 1870 the former Allen family home in Harold’s Cross had already become a ‘Female Orphanage’ with a small central path leading to the front door and an extended north range (now No 199) with a Post Office. In 1936, the main building was still marked on maps as an orphanage. By then the north range was rebuilt, but the shop I remember as Healy’s grocery shop is now closed and derelict. I asked back in 2013 whether we are about to lose another piece of Dublin’s architectural heritage. Nothing has been done since, and the condition of the house continues to deteriorate. As I said some months ago, Harold’s Cross is a Dublin 6 suburb that has a lot going for it. It has good cafés, an interesting social mix of housing, from artisan cottages at Harold’s Cross Bridge to the elegant Victorian houses and villas on Leinster Road and Kenilworth Square. People living in Harold’s Cross may bemoan the loss of the Kenilworth Cinema in recent decades, and the fact there is no major supermarket in the area. But the loss of this house would do far greater damage to the heritage and character of Harold’s Cross. The Irish Government has been urged to take a leading role in an international campaign to ban nuclear weapons. Speaking in Dublin’s Merrion Square at the memorial to the victims of the atomic bombings of Hiroshima and Nagasaki on the 70th anniversary of the attacks, Canon Patrick Comerford, President of the Irish Campaign for Nuclear Disarmament (CND) said that “a moral stance by Ireland can be effective” in bringing about change. Canon Comerford affirmed that the “devastating effects of nuclear weapons on Hiroshima and Nagasaki seven decades ago provide a clear rationale for negotiating a ban,” adding: “The failure of the nuclear powers to disarm heightens the risk that other countries will acquire nuclear weapons. 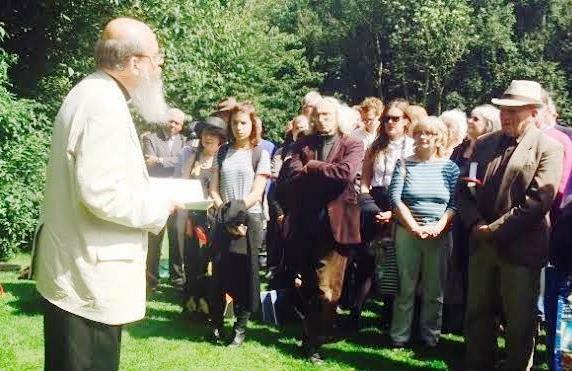 The ceremony, held by Irish CND, was attended by the Lord Mayor of Dublin, Cllr Críona Ní Dhálaigh, who laid a wreath at the Hiroshima Cherry Tree planted in Merrion Square in 1980, and Naoki Yoshimura, first secretary of the Japanese embassy in Dublin, who echoed the call for nuclear disarmament on behalf of the Japanese government.